Plast membership is divided into five age groups. These are for very small children, under the age of 6. They have separate camps, where they camp together with their mothers. This early start program was found to be very helpful. Activity with the novaky largely focuses on play with various content and themes. The games teach the novak, under the guidance of the ‘bratchyk’ to learn about theirselves, their family, Plast and their nation and its history. Meetings, singing, trips make up the programme of activity. The activity here is centred on self-development (character building). With the help of their ‘scout leader’ yunaky plan their own activities, choose their own goals or aims. They achieve this through hikes, camps, sport and singing. Camps are particularly instrumental in developing character in the youngsters. Living in nature teaches them independence, co-operation and the importance of helping others. These are adults who have gained the Plast attainment awards and are ready to become involved in the Ukrainian community and are also able to take on Plast leader responsibilities or organisational work in Plast, planning camps and leading activities. After the age of 35 some seniory carry on undertaking Scout leader work. Others take part in the organisational sphere. Many others devote their time to community affairs, or continue as advisers. 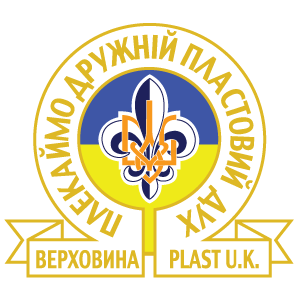 In addition to the above, there exists also “plast-pryiat”, a kind of Scout parent - teacher organization. All parents of young Scouts are expected to join, as well as any other person who wants to help the Scouting movement. Their role is usually to provide financial and moral support, help with transportation and help in campsites etc.